The Co-Discoverer Of Ebola Never Imagined An Outbreak Like This : Goats and Soda In 1976, scientist Peter Piot was part of the team that discovered the Ebola virus. The epidemic today in West Africa, he says, is "absolutely unexpected and unprecedented." 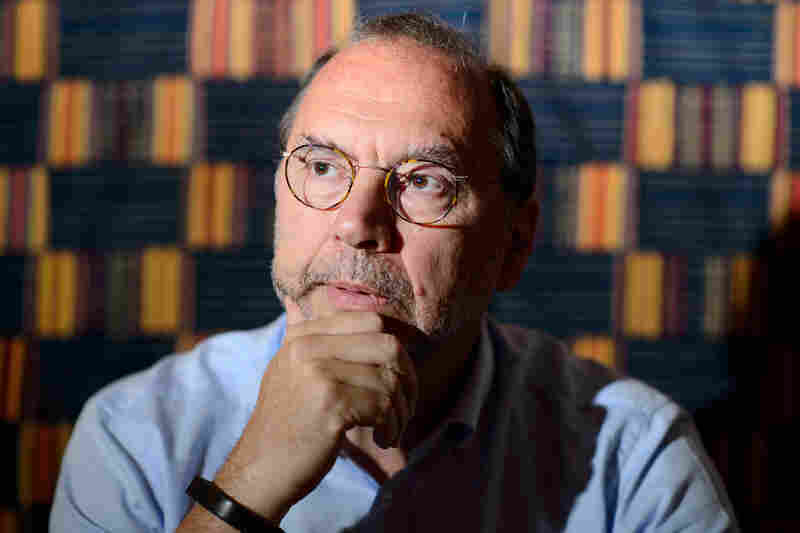 Peter Piot was one of the co-discoverers of the Ebola virus in 1976. "I never thought we would see such a devastating and vast epidemic," he says. As a young scientist in Belgium, Peter Piot was part of a team that discovered the Ebola virus in 1976. He took his first trip to Africa to investigate this mysterious disease. In the Democratic Republic of Congo, he met people who had contracted it. "I'll never forget the glazed eyes, the staring and the pain ... this type of expression in the eyes ... telling me I'm going to die," says Piot. "That I'll never forget." Piot went on to study AIDS in the 1980s and became founding executive director of the Joint United Nations Program on HIV/AIDS. He is now director of the London School of Hygiene and Tropical Medicine. In an interview with NPR's Melissa Block, Piot tells the story of Ebola's discovery: He and his colleagues were looking at samples from a Belgian nun who had died of a disease in Congo. The question he thought he was trying to answer: Was it yellow fever? Instead it was a new disease. "I was excited," he recalls, "because one of the dreams of any microbiologists is to discover a new pathogen. That was very excited. But I certainly didn't think it would develop into such a human tragedy as we're seeing now in West Africa." "This is absolutely unexpected and unprecedented," he says. "We have here a situation where Ebola finds an enormously fertile ground in very poor countries with very dysfunctional health systems," he says. "A country like Liberia in 2010 only 51 doctors for the whole country." He hopes there will never be another outbreak like this one. "I hope that this is the last epidemic where all we have [as treatment] is isolation of patients and quarantines and some supportive care, and we don't have stockpiles of vaccines and therapies." There is potential for Ebola to spread to neighboring African countries, he says, but he is not worried about "high-income countries." "Our basic hospital hygiene is such that it is highly unlikely it would give rise to epidemics," he says. But he does warn that we are moving into a future where health risks will increase: "We'll have to be prepared that in a globalized world, these viruses will spread much faster than ever before." Note: Quotes in this story have been edited for length and clarity.